100% highest quality Blue Squirrel. Tesshu was very particular about every detail of this powder brush. 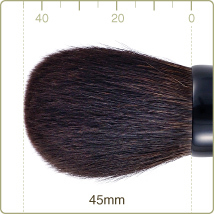 Its volume and density is balanced to offer you the perfect smoothness. At present we sell our products to USA, CANADA and EU states. We hope for your kind understanding. After your purchase, in some cases we will send you an identity confirmation e-mail. In the case identity verification, via reply to said e-mail, is not possible, we might be unable to process the credit card transaction. Please understand.